It may not be easy being green, but it sure looks good. Thanks to this Flexible Waterproof 9 LED Light, you can make your friends and LAN party opponents glow with the glorious color of envy. Built in a clear silicon pod that is flexible, heat resistant and water proof, this Flexible Green LED Light boasts over nine separate LEDs for a tremendous amount of illumination. 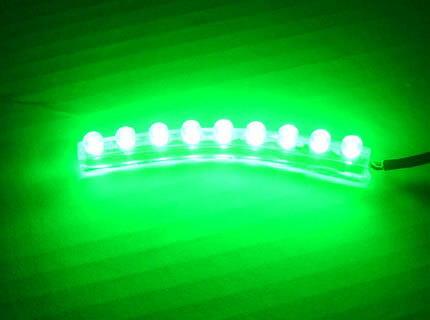 Perfect for interior or exterior illumination, this Green Waterproof LED Light can be mounted in an endless variety of places on your PC. If you want a serious dosage of style, brightness, and functionality, this is the perfect mod to unleash your untapped creativity.